Thank you for shopping at SwingSetMall.com! Please use the following table of contents to navigate through our Shopping Policies. You can place your order at SwingSetMall.com with confidence! If you find a currently offered lower total price (including shipping/handling etc.) on your complete order at any online competitor within 30 days of your purchase, email us a link to the online source. Once verified, we will not only match the price but also provide you with a 10% refund of the difference! To start your request, please visit our Low Price Guarantee page. The guarantee applies to the total cost of your complete order including shipping/handling. Prices and shipping/handling cost at competitors' websites must be verifiable online. Applies only to non-auction site consumer prices on identical items. Comparable products that differ in manufacturing source, quality, and/or specific features may not be covered by the guarantee. Included are our own prices (except for specific sales that specify otherwise), competitors' regular prices, special prices, and any web discount offered on the item(s). The item(s) must be or have been in-stock and ready to ship from the competitor at the time of your order from SwingSetMall.com. 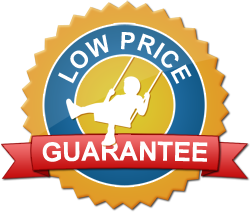 SwingSetMall.com Online Coupons and other special pricing offers do not apply to orders discounted due to the guarantee. If the price you have found elsewhere is lower than our cost, we reserve the right to revoke the guarantee. However, if we do so, we will – on request – provide proof that the price is below our cost. 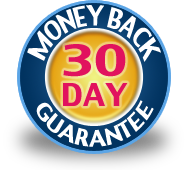 For your peace of mind, we offer a 30-Day Money Back Guarantee on all the non-custom playground parts and accessories we sell. If you are dissatisfied for any reason with the products you receive, items are fully refundable (not including actual shipping costs and processing fees *) if returned in new, unused, re-sellable condition. You must contact us prior to returning any item for refund in order to obtain further instructions regarding the specific item/s you are returning. * IMPORTANT! Note that actual shipping costs and processing fees will be deducted from the amount credited on the return of items from "Free Shipped" orders. The average deduction is 15 to 20%. Example: If $100.00 of items are returned, the credit applied will be approximately $80.00 to $85.00. To be authorized, returns must be made within 30 days of the date of purchase or 10 days of receipt of the order, whichever is later. Non-defective returned merchandise must be in original packaging and must be delivered in new and unused condition which allows it to be resold. All shipping charges and processing fees will be deducted from any credit due on all returned merchandise. All product orders are considered valid until canceled. Orders not canceled with cancellation acknowledged by SwingSetMall.com prior to shipping will incur shipping charges and processing fees when merchandise is returned as per above. Returns by common carrier freight (truck) are allowed only if the buyer pays freight both ways in advance. A restocking fee of up to 25% may apply to specific items, especially but not exclusively larger items, including Slides, Stand-Alone Events, Play Structures, Ball Sports, and Site Amenities. All returned merchandise must be shipped to the warehouse of origin. Because of this, it is important to contact us before you return any item. Items returned to the wrong warehouse are not refundable. You must include "SwingSetMall.com" on the outside of the box regardless to which warehouse the item/s is/are being returned. IMPORTANT! Shipping warehouses are busy places that sometimes lose things and information. For this reason, it is vitally important that you save the tracking number of your return shipment so (if necessary) you can prove its successful return. We understand mistakes in ordering happen. We do our best to catch and correct mistakes in quantities, items which won't work together, etc. by making attempts to contact the customer. We also make every effort to make changes to an order that a customer requests before an order ships. Due to our commitment to fulfilling orders as quickly as possible, however, it is very important to contact us right away by phone or email if you need changes made to your order. After placing an order on SwingSetMall.com, if you realize you need to change quantities, add or remove items for your order which affect the total cost, you have 12 hours to contact us by phone or email with the desired changes, unless your order has already shipped. Any order that has not already shipped and is older than 12 hours, can be changed, but will incur a $10.00 administrative fee. If you would like to change colors of items on your order, we will make every effort to make the changes prior to shipping. However, after shipment, the order is finalized and cannot be changed and will need to be processed as a return (see return policy above). You will need to call and/or email us to ensure the changes get made. Should you need to cancel an order, you have up to the time of shipment to do so with a complete refund for most items. Some items ordered may require a restocking fee, even before shipment, which will be deducted from the refund amount. Once items on your order have shipped, any shipping, handling and restocking fee costs will be deducted from the refund amount. Some custom items, such as roto-molded slides, powder-coated components, and custom name plates are non-refundable. SwingSetMall.com offers a one year (12 month) warranty on material and workmanship defects for the items and components under the SwingSetMall brand as well as those that ship from our Bremerton, WA warehouse. We specifically do not express or imply any direct warranty on items that ship from other factories or fulfillment warehouses. All such warranties are the responsibility of the shipping entity. However, it is typical that warranties on such items are also for a one year (12 month) period from the shipping date. This warranty applies only to the use of the items we provide in appropriate settings and for their intended use/s (for example, residentially rated items are not warranted for commercial use). Typically, digital emailed photo/s that clearly show the item's defect/s are sufficient to determine correct application of the warranty agreement. Where photos do not make clear the defect/s, you may be required to return the item to the original shipping warehouse - at your expense - to prove the defect/s. Upon accepted proof of defect - and at your option - we will provide replacement (if available), gift certificate credit, or a full 100% refund on defective items, not including shipping and handling costs, within the warranty period. SwingSetMall.com expressly disclaims liability for any injury, loss, or damage arising from the use of or inability to use an item sold by us. With proper notification and proof of defect within the warranty period, our only obligation is to replace or provide credit for any item that is delivered defective or becomes defective within the warranty period, and this obligation is limited. For larger items delivered by common carrier shipment (truck), warranted defective products will, at the option of the shipping factory or fulfillment warehouse, be replaced or repaired via warranty service from the manufacturer's field warranty service centers and/or subcontractors. No sales tax is charged on orders shipped to locations outside of Washington State. Orders that ship to Washington State addresses are subject to state sales tax on all retail sales to the end user. Currently, sales tax is charged on the subtotaled order (including shipping and handling) at the rate of 9%. These monies are in addition to and are not included in our online pricing. With provision of your Washington State business license and your expressed intention to use the products sold in a value added product for resale or for the direct resale of the items purchased, sales tax is not collected. All item prices, descriptions, and specifications are subject to change without notice. SwingSetMall.com shall not be held liable for graphic, clerical, typographical, descriptive, or printing errors. While great care is given to our site and catalog publications, errors do sometimes occur – for those errors we apologize in advance. At SwingSetMall.com, we are committed to honoring the privacy of our members and visitors. The following discloses our information gathering and use practices. Please note that this privacy statement applies only to this site and not to other companies' or organizations' websites to which this site links. SwingSetMall.com is sensitive to privacy issues with respect to the use of customer information provided to us over the Internet. We believe it is important for you to know how we treat the information about you that is received by us when you visit. In general, you can visit SwingSetMall.com here on the World Wide Web without telling us who you are or revealing any information about yourself. Our web servers collect certain information like, domain names and IP addresses but not the e-mail addresses of our visitors. The information we do collect is aggregated to measure the number of visits, average time spent on the site, number of pages viewed, and methods by which our site was found. SwingSetMall.com uses this information to evaluate the use of our site and to continuously improve the content being provided. While SwingSetMall.com may use this information to contact or send materials to you for marketing purposes, we will take commercially reasonable steps to safeguard the information from unauthorized access and, unless we specifically disclose it to you at the time of collection, we will not make customer-specific information that is gathered on our site available to unaffiliated organizations for commercial purposes unrelated to the business of SwingSetMall.com. From time to time, SwingSetMall.com may engage the services of consultants, contractors, agents, representatives and other third parties, to assist SwingSetMall.com in operating this site and/or performing other activities in connection with SwingSetMall.com's operations. SwingSetMall.com may provide such third parties with this information for the purpose of enabling such parties to provide support to SwingSetMall.com. SwingSetMall.com may make use of a technology called cookies, in order to provide you with information that is tailored specifically to your needs and/or interests. A cookie is a tiny element of data that a web site can send to your browser, which may then be stored on your hard drive so we can recognize you when you return. An example of how a cookie may be used to help improve your shopping experience is by storing the products you have added to the shopping cart on our site. If you leave our website, a cookie retains the information from your last visit so that when you return, the items in your cart will still be there. You may set your browser to notify you or decline the receipt of a cookie. Most web browsers also give you the ability to delete cookies from specific websites, or to clear them altogether. If you have any questions or comments about this privacy statement, the business practices of SwingSetMall.com, or your dealings with this website, you can Contact Us. You can shop at SwingSetMall.com assured that we take security very seriously. We have partnered with two companies to ensure that your private information be kept safe and secure when you shop with us. Our shopping cart is secured with a GoDaddy.com Web Server Certificate. That means all transactions on our site are protected with up to 256-bit Secure Sockets Layer encryption. Before issuing a certificate, GoDaddy.com rigorously authenticates the requestor’s domain control. The authentication process ensures that customers can rest assured that a website protected with a GoDaddy.com certificate can be trusted. Industry leading encryption hardware and software methods and security protocols that provide the best possible protection for sensitive customer information. SwingSetMall.com is registered with the Authorize.net Verified Merchant Seal program. For more, see our 5 Great Reasons to Shop at SwingSetMall.com page.